The Board of Education is embarking on a charter school listening tour, after complaints from charter school leaders about current oversight. The Board of Education is holding a “charter school listening tour” and exploring the possibility of creating additional charter school authorizers, after complaints from school leaders about a state commission created three years ago to improve charter accountability. The BOE is tasked with overseeing the Hawaii State Public Charter School Commission, but has not done any formal evaluation of the commission since its creation in 2012, BOE Executive Director Alison Kunishige said. The public listening events, led by Board Member Jim Williams, are for information gathering and starting that evaluation process, Kunishige said. 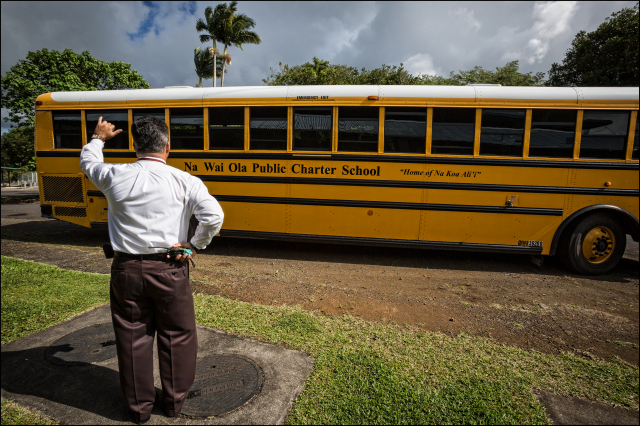 Principal Daniel J. Caluya flashes the shaka goodbye to students as the bus pull out at Na Wai Ola Public Charter School, located in Mountain View on the Big island. The Hawaii Public Charter Schools Network and some school leaders feel that charter schools in the state are increasingly overburdened with reporting requirements and red tape. “We are being regulated to the max,” said Connections Public Charter School Principal John Thatcher — who met with lawmakers in Hilo last week to voice complaints about the commission. 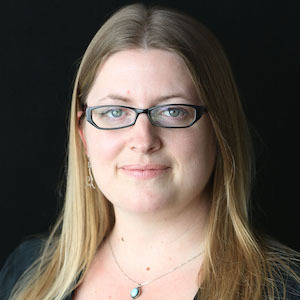 The commission’s executive director meanwhile says such complaints are indicative of growing pains in a system that was revamped by lawmakers in the wake of several charter school scandals. Lawmakers created the Hawaii Public Charter School Commission in 2012 with Act 130, which put in place some significant changes for the charter school system in Hawaii — including a provision for schools to enter into performance contracts with the commission. Prior to 2012, charter schools were overseen by an office that had dual — and sometimes conflicting — roles providing both oversight and advocacy for charter schools. 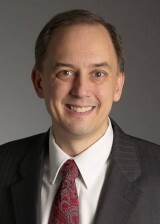 Tom Hutton is executive director of the Hawaii State Public Charter School Commission. The switch to a commission focused almost entirely on oversight still rankles some in the charter school community, who feel the commission should not criticize charter schools to the media and should be providing more support for schools. Long-simmering tensions between school leaders and the Charter School Commission have heated up in recent months, as the commission worked on creating rules for upcoming charter school contract renewals. Charter schools in the state just finished year one of a three-year contract. When up for renewal in two years, schools will be eligible for contracts that vary in length using a methodology based predominantly on academic performance. The highest performing schools will be eligible for a five-year contract. The commission initially proposed a one-year contract extension for low-performing schools, but changed that after feedback from the charter school community. The final renewal criteria, approved in mid-November, will give even the lowest performing schools the possibility of a two- or three-year contract, Hutton said. Last year six charter schools scored in the top 20 percent of schools in the state and 10 ranked in the bottom 20 percent of schools, according to the commission’s annual report. One frequent complaint among charters is that there is not enough help offered to schools that are struggling academically and that it isn’t fair to just tell schools they are not meeting expectations. Commission Chair Catherine Payne said she agrees that schools need more help. Philosophical differences about the role of charter schools also seem to be at play in the discord. 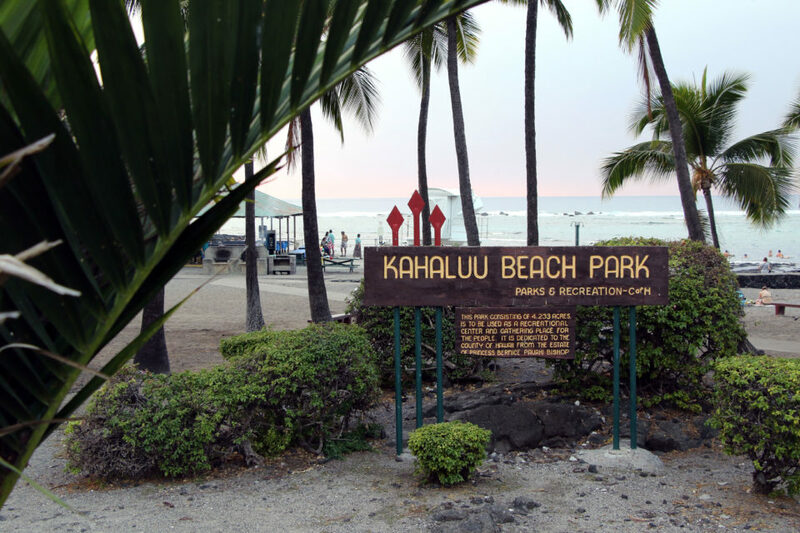 “I don’t necessarily think that people early on in chartering in Hawaii ever conceived of it as a sort of entrepreneurial and potentially high stakes thing,” Hutton said. The “charter bargain” as it is understood in many states, Hutton said, is that charter schools get increased autonomy and taxpayer funding in exchange for improved academic results. In Hawaii, charter schools evolved out of a movement where community empowerment may have been seen as an end unto itself, he said. Charter schools shouldn’t be closed down just because they are struggling academically, Thatcher argues. The Department of Education wouldn’t shut down a public school because it was low-achieving, Thatcher said. Instead, the DOE would work with the school to improve. Hutton points out that no schools are being threatened with closure for academic performance issues right now, and that struggling schools will be given multiple opportunities to improve. The commission is the only authorizer of new charter schools in Hawaii, something that the Hawaii Public Charter Schools Network hopes to see change. The BOE has the power to do that, but the first step is determining if such a change is necessary, Kunishige, the BOE’s executive director, said. Around 30 people showed up to the first BOE charter school listening event in Oahu on Nov. 19, she said. The listening tour is for informational purposes only. No board action is expected from the informal events, Kunishige said. The second of three planned BOE listening tour events is scheduled for Monday in Hilo at Ka Umeke Kaeo Public Charter School.